The routine uses of spirometry include the obvious identification and classification of respiratory disease, into obstructive and restrictive respiratory disorders. However, serial spirometry can also be involved in more specialist diagnostic techniques which include: 1) bronchial challenge testing; 2) exercise tests (ergospirometry); and 3) therapeutic assessments e.g. clinical trials or nebuliser trials. The least used of these three techniques is the newer technology of ergospirometry. Modern exercise testing systems which measure real-time ventilation (as opposed to the old “Douglas Bag” technique) enable measurement of flow–volume loops during an incremental exercise test. The following case report shows an example of using ergospirometry to uncover a clinical problem that may have remained unsolved without it. A 42-yr-old woman who was a keen sportswoman and played hockey regularly, had noticed over the last few years that she got wheezy on exertion. Her symptoms seemed worse between April and September/October and she wondered if it was related to the pollen season. She tried salbutamol but it was no help. She also noticed that, as soon as she gets to a sprinting pace or ran for a long period, her breathing became noisy. She felt limited by this inspiratory noise. At rest, she was fine and had no nocturnal symptoms. She worked as a geneticist/scientist in a hospital but was not exposed to chemicals, etc. She noticed occasional sharp chest pains in the centre of her chest which only occurred very occasionally. She had a history of nasal polyps and a possible postnasal drip. There was no leg swelling. She was referred to a respiratory physician who requested full lung function tests. Haematology, biochemistry and immunology results were all normal. Overall, she was very fit with good physique and normal breathing pattern at rest. Lung function tests showed normal gas transfer and lung volumes (table 1) but spirometry showed some small airways obstruction and she demonstrated some reversibility (700 mL in forced vital capacity) to four puffs of salbutamol. Her symptoms occurred during exercise only so an exercise-induced bronchospasm protocol (80% predicted max heart rate) was planned to investigate her respiratory responses during exercise with particular emphasis on ergospirometry as a part of the measurement. 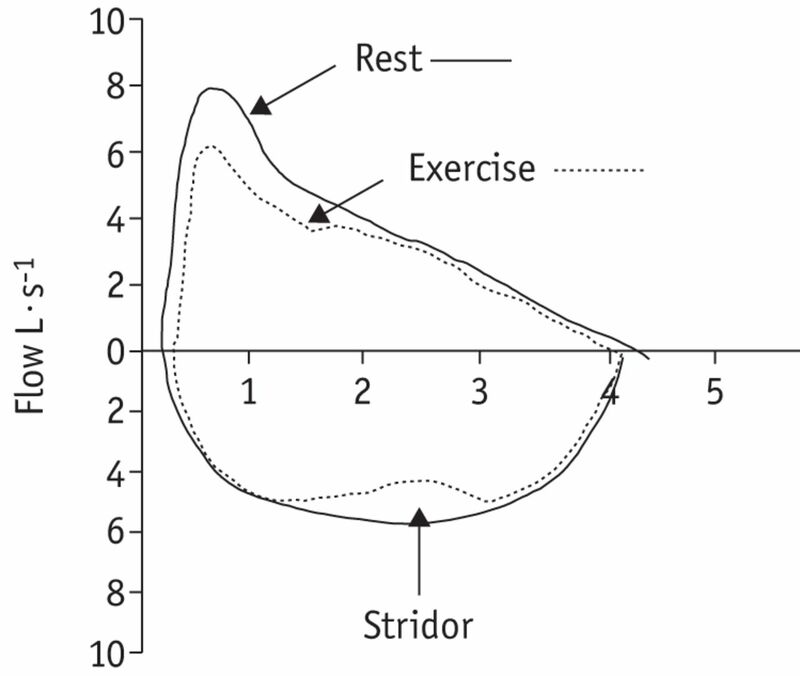 A flow–volume loop was performed at rest and then during exercise using the ergospirometry option on the Medisoft Exp’Air cardio-pulmonary exercise system. During the early phases of the exercise test, she showed the usual ventilatory patterns associated with an athletic/fit subject with low–normal ventilation for the workload achieved. Her cardiac function was very good with a low rate and higher oxygen pulse (a surrogate for stroke volume). As the workload increased, she achieved 98% of her maximum predicted heart rate. Analysis of the flow–volume loops showed a flattening of the inspiratory curve (fig. 1). These studies show firstly some degree of small airways obstruction, which, together with her rhinitis and symptoms, is consistent with mild asthma. What was surprising however, was the appearance and validation of stridor during exercise which may be related to a vocal cord dysfunction. From the ergospirometry, it appeared that the patient was closing her vocal cords during inspiration and therefore had a degree of exercise-induced inspiratory and expiratory vocal cord dysfunction. She was referred to a specialist sports physiotherapist who undertook breathing exercises and help overcome this limitation to ventilatory function on exercise. Other causes of EILO (exercise-induced laryngeal obstruction), can include not only vocal cord dysfuntion but also laryngeal dysfunction and tracheobronchial malacia. Laryngeal dysfunction is increasingly recognised in chronic persistent cough. Symptoms, such as voice hoarseness, dyspnoea, wheeze and cough may all occur as a result of laryngeal dysfunction . Speech language therapy is effective in these cases . Tracheobronchial malacia, is usually associated with a congenital abnormality in children but can occur in adults as well. It can present as either inspiratory or expiratory stridor. Surgery, stents and even assisted ventilation can be used to treat the condition. Flow–volume loops can be useful in monitoring interventions.
. Voice and upper airway symptoms in people with chronic cough and paradoxical vocal fold movement. J Voice 2007; 21: 361–383.
. Efficacy of speech pathology management for chronic cough: a randomised placebo controlled trial of treatment efficacy. Thorax 2006; 61: 1065–1069.